JMS (Just Merino Sheepskin) Seat Covers are simply luxurious. Made specifically by JMS for ReactorPanel, these are the thickest, softest, most durable covers available, made exclusively from 100% Merino sheepskin pelts. The full seat covers fit snugly over the entire saddle, including the flaps. They attach with an elastic strap that runs under the saddle and attaches to a neoprene pocket that hugs the cantle. To further secure the fit, there are four ties that attach to d-rings at the pommel and seat. 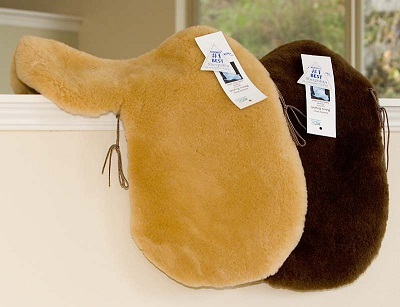 Top-shelf, dense merino sheepskin, made specifically for ReactorPanel Saddles. It also tends to fit generously proportioned traditional saddles a bit better than our other line of covers. Very High Quality! Available in Black, Brown, Tan.